When writing an application, it's important to consider exactly what your graphical demands will be. Varying graphical tasks are best accomplished with varying techniques. For example, graphics and animations for a rather static application should be implemented much differently than graphics and animations for an interactive game. Here, we'll discuss a few of the options you have for drawing graphics on Android and which tasks they're best suited for. Android provides a set of View widgets that provide general functionality for a wide array of user interfaces. You can also extend these widgets to modify the way they look or behave. In addition, you can do your own custom 2D rendering using the various drawing methods contained in the Canvas class or create Drawable objects for things such as textured buttons or frame-by-frame animations. Beginning in Android 3.0, you can hardware accelerate the majority of the drawing done by the Canvas APIs to further increase their performance. Android supports OpenGL ES 1.0 and 2.0, with Android framework APIs as well as natively with the Native Development Kit (NDK). Using the framework APIs is desireable when you want to add a few graphical enhancements to your application that are not supported with the Canvas APIs, or if you desire platform independence and don't demand high performance. There is a performance hit in using the framework APIs compared to the NDK, so for many graphic intensive applications such as games, using the NDK is beneficial (It is important to note though that you can still get adequate performance using the framework APIs. For example, the Google Body app is developed entirely using the framework APIs). OpenGL with the NDK is also useful if you have a lot of native code that you want to port over to Android. For more information about using the NDK, read the docs in the docs/ directory of the NDK download. Draw your graphics or animations into a View object from your layout. In this manner, the drawing of your graphics is handled by the system's normal View hierarchy drawing process — you simply define the graphics to go inside the View. Draw your graphics directly to a Canvas. This way, you personally call the appropriate class's onDraw()method (passing it your Canvas), or one of the Canvas draw...()methods (like drawPicture()). In doing so, you are also in control of any animation. Option "a," drawing to a View, is your best choice when you want to draw simple graphics that do not need to change dynamically and are not part of a performance-intensive game. For example, you should draw your graphics into a View when you want to display a static graphic or predefined animation, within an otherwise static application. Read Drawables for more information. In the same thread as your UI Activity, wherein you create a custom View component in your layout, call invalidate()and then handle the onDraw()callback. Or, in a separate thread, wherein you manage a SurfaceViewand perform draws to the Canvas as fast as your thread is capable (you do not need to request invalidate()). When you're writing an application in which you would like to perform specialized drawing and/or control the animation of graphics, you should do so by drawing through a Canvas. A Canvas works for you as a pretense, or interface, to the actual surface upon which your graphics will be drawn — it holds all of your "draw" calls. Via the Canvas, your drawing is actually performed upon an underlying Bitmap, which is placed into the window. Now your Canvas will draw onto the defined Bitmap. After drawing upon it with the Canvas, you can then carry your Bitmap to another Canvas with one of the Canvas.drawBitmap(Bitmap,...)methods. It's recommended that you ultimately draw your final graphics through a Canvas offered to you by View.onDraw()or SurfaceHolder.lockCanvas()(see the following sections). The Canvasclass has its own set of drawing methods that you can use, like drawBitmap(...), drawRect(...), drawText(...), and many more. Other classes that you might use also have draw()methods. For example, you'll probably have some Drawableobjects that you want to put on the Canvas. Drawable has its own draw()method that takes your Canvas as an argument. If your application does not require a significant amount of processing or frame-rate speed (perhaps for a chess game, a snake game, or another slowly-animated application), then you should consider creating a custom View component and drawing with a Canvas in View.onDraw(). The most convenient aspect of doing so is that the Android framework will provide you with a pre-defined Canvas to which you will place your drawing calls. To start, extend the Viewclass (or descendant thereof) and define the onDraw()callback method. This method will be called by the Android framework to request that your View draw itself. This is where you will perform all your calls to draw through the Canvas, which is passed to you through the onDraw()callback. The Android framework will only call onDraw()as necessary. Each time that your application is prepared to be drawn, you must request your View be invalidated by calling invalidate(). This indicates that you'd like your View to be drawn and Android will then call your onDraw()method (though is not guaranteed that the callback will be instantaneous). Inside your View component's onDraw(), use the Canvas given to you for all your drawing, using various Canvas.draw...()methods, or other class draw()methods that take your Canvas as an argument. Once your onDraw()is complete, the Android framework will use your Canvas to draw a Bitmap handled by the system. Note: In order to request an invalidate from a thread other than your main Activity's thread, you must call postInvalidate(). For information about extending the Viewclass, read Building Custom Components. For a sample application, see the Snake game, in the SDK samples folder: /samples/Snake/. The SurfaceViewis a special subclass of View that offers a dedicated drawing surface within the View hierarchy. The aim is to offer this drawing surface to an application's secondary thread, so that the application isn't required to wait until the system's View hierarchy is ready to draw. Instead, a secondary thread that has reference to a SurfaceView can draw to its own Canvas at its own pace. To begin, you need to create a new class that extends SurfaceView. The class should also implement SurfaceHolder.Callback. This subclass is an interface that will notify you with information about the underlying Surface, such as when it is created, changed, or destroyed. These events are important so that you know when you can start drawing, whether you need to make adjustments based on new surface properties, and when to stop drawing and potentially kill some tasks. Inside your SurfaceView class is also a good place to define your secondary Thread class, which will perform all the drawing procedures to your Canvas. Instead of handling the Surface object directly, you should handle it via a SurfaceHolder. So, when your SurfaceView is initialized, get the SurfaceHolder by calling getHolder(). You should then notify the SurfaceHolder that you'd like to receive SurfaceHolder callbacks (from SurfaceHolder.Callback) by calling addCallback()(pass it this). Then override each of the SurfaceHolder.Callbackmethods inside your SurfaceView class. In order to draw to the Surface Canvas from within your second thread, you must pass the thread your SurfaceHandler and retrieve the Canvas with lockCanvas(). You can now take the Canvas given to you by the SurfaceHolder and do your necessary drawing upon it. Once you're done drawing with the Canvas, call unlockCanvasAndPost(), passing it your Canvas object. The Surface will now draw the Canvas as you left it. Perform this sequence of locking and unlocking the canvas each time you want to redraw. Note: On each pass you retrieve the Canvas from the SurfaceHolder, the previous state of the Canvas will be retained. In order to properly animate your graphics, you must re-paint the entire surface. For example, you can clear the previous state of the Canvas by filling in a color with drawColor()or setting a background image with drawBitmap(). Otherwise, you will see traces of the drawings you previously performed. For a sample application, see the Lunar Lander game, in the SDK samples folder: /samples/LunarLander/. Or, browse the source in the Sample Code section. Android offers a custom 2D graphics library for drawing shapes and images. The android.graphics.drawablepackage is where you'll find the common classes used for drawing in two-dimensions. This document discusses the basics of using Drawable objects to draw graphics and how to use a couple subclasses of the Drawable class. For information on using Drawables to do frame-by-frame animation, see Drawable Animation. A Drawableis a general abstraction for "something that can be drawn." You'll discover that the Drawable class extends to define a variety of specific kinds of drawable graphics, including BitmapDrawable, ShapeDrawable, PictureDrawable, LayerDrawable, and several more. Of course, you can also extend these to define your own custom Drawable objects that behave in unique ways. There are three ways to define and instantiate a Drawable: using an image saved in your project resources; using an XML file that defines the Drawable properties; or using the normal class constructors. Below, we'll discuss each the first two techniques (using constructors is nothing new for an experienced developer). A simple way to add graphics to your application is by referencing an image file from your project resources. Supported file types are PNG (preferred), JPG (acceptable) and GIF (discouraged). This technique would obviously be preferred for application icons, logos, or other graphics such as those used in a game. To use an image resource, just add your file to the res/drawable/directory of your project. From there, you can reference it from your code or your XML layout. Either way, it is referred using a resource ID, which is the file name without the file type extension (E.g., my_image.pngis referenced as my_image). Note: Image resources placed in res/drawable/may be automatically optimized with lossless image compression by the aapttool during the build process. For example, a true-color PNG that does not require more than 256 colors may be converted to an 8-bit PNG with a color palette. This will result in an image of equal quality but which requires less memory. So be aware that the image binaries placed in this directory can change during the build. If you plan on reading an image as a bit stream in order to convert it to a bitmap, put your images in the res/raw/folder instead, where they will not be optimized. The following code snippet demonstrates how to build an ImageViewthat uses an image from drawable resources and add it to the layout. Note: Each unique resource in your project can maintain only one state, no matter how many different objects you may instantiate for it. For example, if you instantiate two Drawable objects from the same image resource, then change a property (such as the alpha) for one of the Drawables, then it will also affect the other. So when dealing with multiple instances of an image resource, instead of directly transforming the Drawable, you should perform a tween animation. The XML snippet below shows how to add a resource Drawable to an ImageViewin the XML layout (with some red tint just for fun). For more information on using project resources, read about Resources and Assets. By now, you should be familiar with Android's principles of developing a User Interface. Hence, you understand the power and flexibility inherent in defining objects in XML. This philosophy caries over from Views to Drawables. If there is a Drawable object that you'd like to create, which is not initially dependent on variables defined by your application code or user interaction, then defining the Drawable in XML is a good option. Even if you expect your Drawable to change its properties during the user's experience with your application, you should consider defining the object in XML, as you can always modify properties once it is instantiated. Any Drawable subclass that supports the inflate()method can be defined in XML and instantiated by your application. Each Drawable that supports XML inflation utilizes specific XML attributes that help define the object properties (see the class reference to see what these are). See the class documentation for each Drawable subclass for information on how to define it in XML. Refer to the Drawable classes listed above for more information on the XML attributes supported by each. 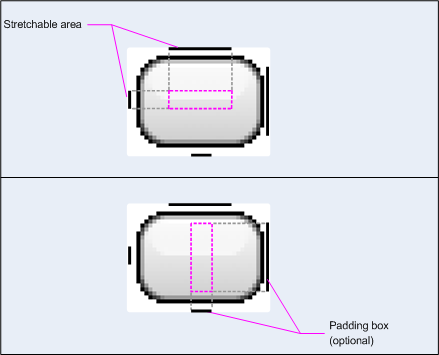 When you want to dynamically draw some two-dimensional graphics, a ShapeDrawableobject will probably suit your needs. With a ShapeDrawable, you can programmatically draw primitive shapes and style them in any way imaginable. In the constructor, a ShapeDrawable is defines as an OvalShape. It's then given a color and the bounds of the shape are set. If you do not set the bounds, then the shape will not be drawn, whereas if you don't set the color, it will default to black. The ShapeDrawable class (like many other Drawable types in the android.graphics.drawablepackage) allows you to define various properties of the drawable with public methods. Some properties you might want to adjust include alpha transparency, color filter, dither, opacity and color. You can also define primitive drawable shapes using XML. For more information, see the section about Shape Drawables in the Drawable Resources document. A NinePatchDrawablegraphic is a stretchable bitmap image, which Android will automatically resize to accommodate the contents of the View in which you have placed it as the background. An example use of a NinePatch is the backgrounds used by standard Android buttons — buttons must stretch to accommodate strings of various lengths. A NinePatch drawable is a standard PNG image that includes an extra 1-pixel-wide border. It must be saved with the extension .9.png, and saved into the res/drawable/directory of your project. The border is used to define the stretchable and static areas of the image. You indicate a stretchable section by drawing one (or more) 1-pixel-wide black line(s) in the left and top part of the border (the other border pixels should be fully transparent or white). You can have as many stretchable sections as you want: their relative size stays the same, so the largest sections always remain the largest. You can also define an optional drawable section of the image (effectively, the padding lines) by drawing a line on the right and bottom lines. If a View object sets the NinePatch as its background and then specifies the View's text, it will stretch itself so that all the text fits inside only the area designated by the right and bottom lines (if included). If the padding lines are not included, Android uses the left and top lines to define this drawable area. To clarify the difference between the different lines, the left and top lines define which pixels of the image are allowed to be replicated in order to stretch the image. The bottom and right lines define the relative area within the image that the contents of the View are allowed to lie within. This NinePatch defines one stretchable area with the left and top lines and the drawable area with the bottom and right lines. In the top image, the dotted grey lines identify the regions of the image that will be replicated in order to stretch the image. The pink rectangle in the bottom image identifies the region in which the contents of the View are allowed. If the contents don't fit in this region, then the image will be stretched so that they do.